Vinification & Aging: The grapes were harvested in mid-September, when the grapes reached the vegetative and phenological maturity in order to obtain a refined, elegant tannis that are not too aggressive. At the arrival in the winery, the grapes went into thermal conditioned tanks. The must was left in contact with the skins for 3 days at 60 degrees, allowing for all the color and aroma to be extracted from the skins. At this temperature, the winemakers avoided the abstraction of ‘green’ tannis that cause a strong astringency. After 70 hours, selected yeasts were added, thus beginning the alcoholic fermentation. After 2 days of maceration, the wine was racked. In the spring the wine was bottled and refined in the bottle for at least 3 months prior to its release on the market. Description: Deep, bright red color with an intense aroma of young red fruits. The taste is fruity, intense and inviting, with a consistency to the nose. 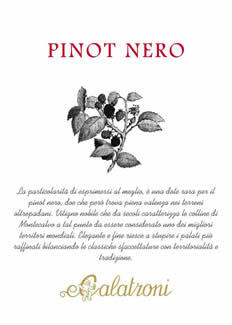 Food Pairing: Excellent with pastas with fresh condiments, good with red meats cooked rare.